Walking Fort Bragg: But not this morning! I set my alarm so I will be up in time for this mornings eclipse. When the alarm went off I discovered our town wrapped in fog. Nothing for it but to roll over and go back to sleep. Later, up and awake, I rooted through my files and found this image. 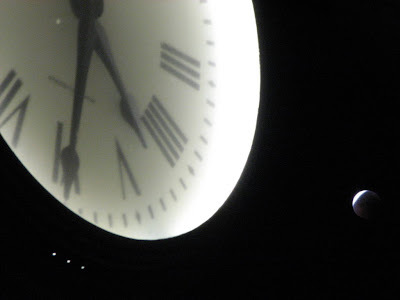 It is a photo I took August 28, at 4:30 in the morning, 2007; our town clock in the foreground. That is a really cool image! I love the sense of time.